Thank you to Satchel and Page for sending this truly gorgeous piece of work over for testing and review! I've spent quite some time getting to know it, toting it around, sniffing it, petting it, and generally being madly in love with it. 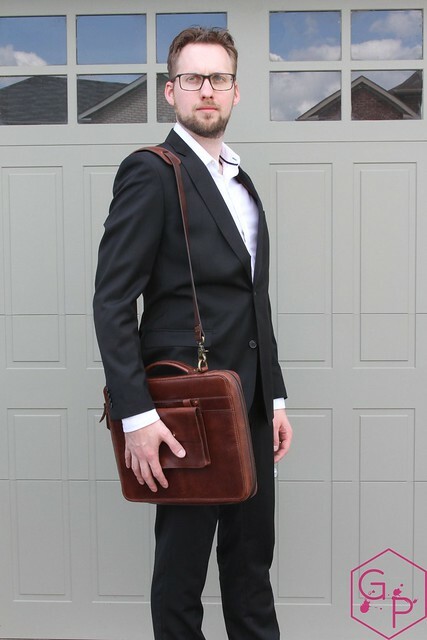 The Modular Leather Tech Portfolios (aka Port Series) is on Kickstarter now! Check it out my peeps. 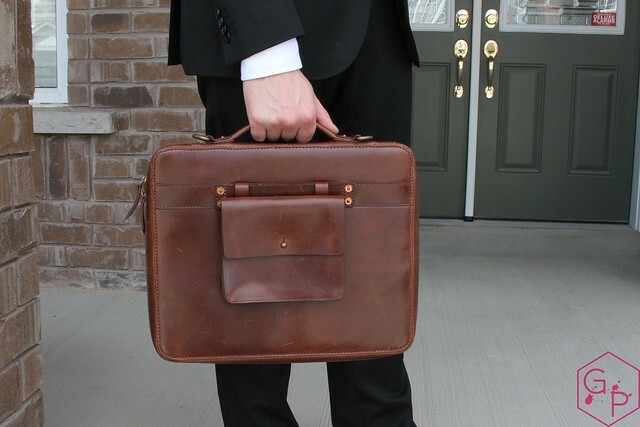 Satchel & Page hand crafts heirloom quality leather pieces, inspired by the founder's grandfather and his Map Case from WWII! Obviously, that map case holds a lot of history and is full of stories. 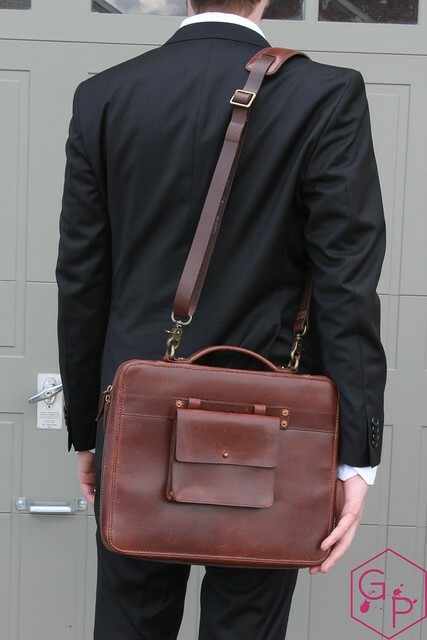 Satchel & Page's designs are inspired by the designs of the 1940s, with added touches for today's technology. 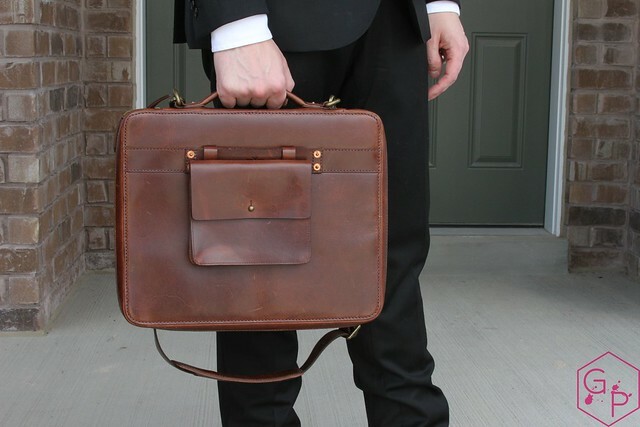 Satchel & Page launched on Kickstarter back in 2013, and I have been following them ever since, as my very close friend ended up backing and became a huge fan when he got his bag. He then got another piece because he loved them so much, so I've been an avid follower for some time. And envying his bags and wishing they were mine. Your Mobile Office - We do our best thinking when things are clean and organized. The Port series comes in 4 sizes and combines a smart layout with a slim profile. No clutter = increased productivity. Refuel Your Devices - When we designed this collection of tech portfolios, we focused on your productivity. Smartly designed layout charges both your phone and tablet while you’re on the go. Never run out of battery again. Modular - Removable outside pocket for battery pack along with interior insert options for a truly customizable carry. Heirloom Quality - Italian, full-grain veg tan leather, Japanese YKK Excella zippers, solid copper rivets. 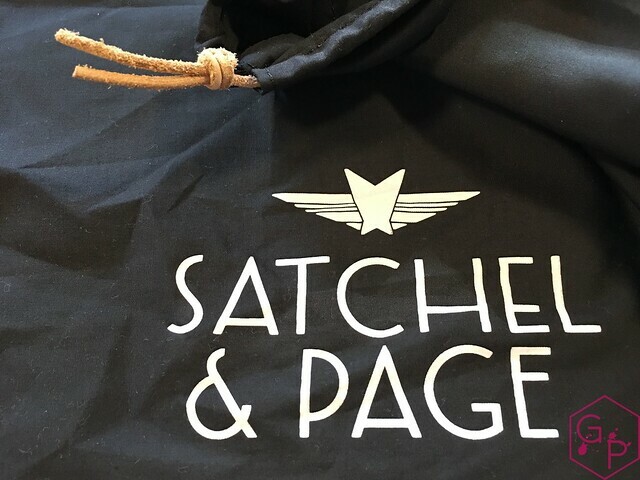 The Satchel & Page Portfolio was sent in a large black dust bag with a leather thong drawstring. 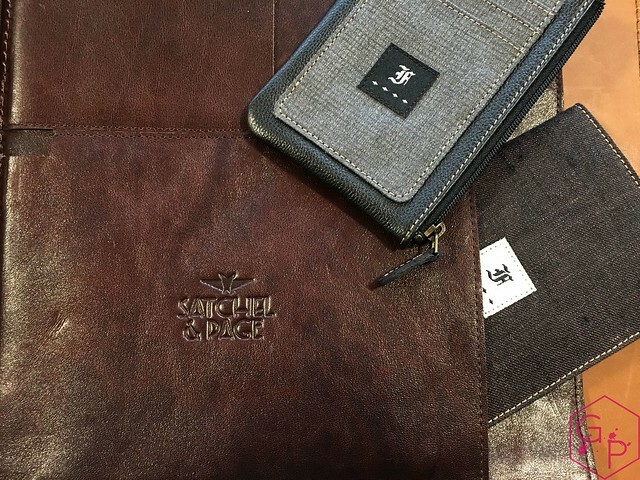 The bag has the Satchel & Page logo printed on it. These are nice for storing your leather goods. I appreciate the clean yet useful and simple presentation. I really don't need or want a box or anything. 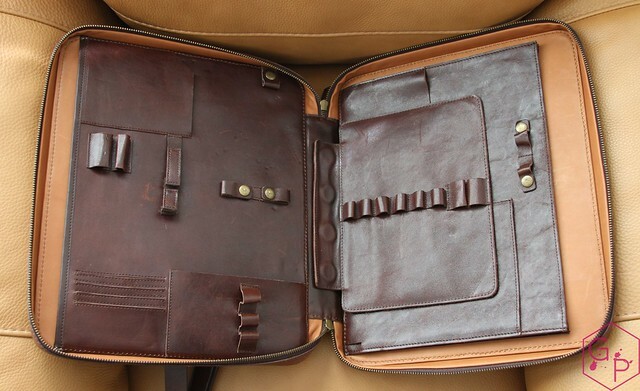 The Leather Tech Portfolio is a cross between leather work, a mobile office/daily carry set up, and a briefcase. It does all these things with sheer class and style. Even if you don't really need it, you're probably going to want it simply because it looks so darned awesome. I'm a sucker for this kind of thing. My Portfolio is a larger size, ready to accommodate a 13" laptop and more. It has a padded carry handle, a padded and adjustable shoulder strap, two zippers around the whole thing, an add-on battery pocket that snaps on to the front and several loops and pockets of various sizes inside. I also have a magnetic Artist insert, as seen in the images. 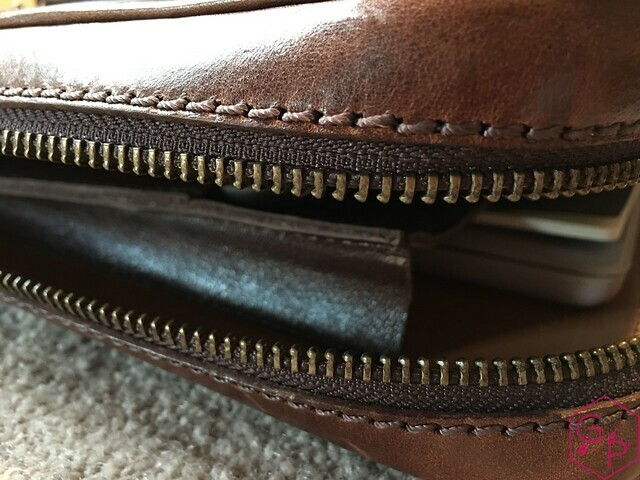 The inside spine has magnets under the leather to make it super easy and quick to attach or remove the insert. The leather is absolutely gorgeous. It is a rich brown with yellow and red tones. The leather picks up scuffs and marks with use, and it pulls up in the areas that are softer. I think it is just beautiful: the entire package looks high quality, classy, and super elegant. The inner lining is a lighter tan, providing great contrast to the darker, richer leather. 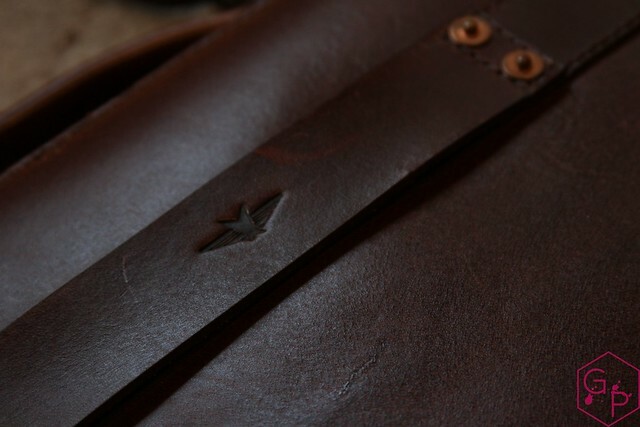 The stitching is dark brown to match the main color and the edges are darkly burnished as well. The final product will be a little less red than the one you see in my pictures. Final zippers will be Japanese YKK Excella, instead of the stock YKK seen on my Portfolio. The Portfolio feels good. 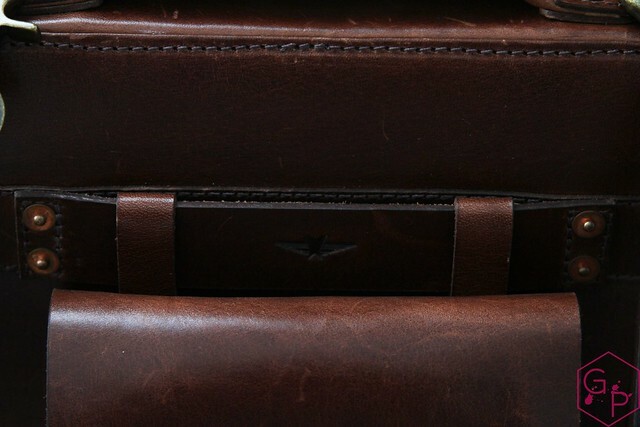 The quality of the leather is apparent, it smells great, it looks great, everything is clean and well done. It just feels good in hand. The flaps are firm and not floppy and saggy, so the Port has always kept its shape whether it's empty or full. The shoulder strap is thick but not bulky, the clasps and rivets are smooth and placed properly (not half stuck in). The handle is smooth and rounded off so carrying the Port feels comfortable. I have used bags that had sharp edges on the carry handle, and it would dig into my palm, making it painful and uncomfortable to carry. The Port ensures that carrying by hand is not a pain. The zippers operate smoothly and even when it's open, the teeth of the zippers don't scratch me when I touch them. 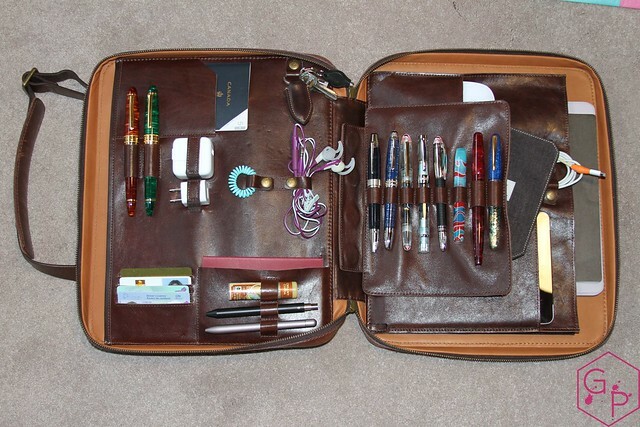 I loaded up the Port with all the mobile office-y/daily carry things I could think I would need. What kind of things would go into my set up? House key, lip balm, earphones, mouse, a pocket notebook or two, phone charger, lightning cable, iPad charger and iPad (if I want to watch Netflix), laptop, relevant cards - debit, credit card, Starbucks gift card, etc. What do I do when I am in mobile office mode? 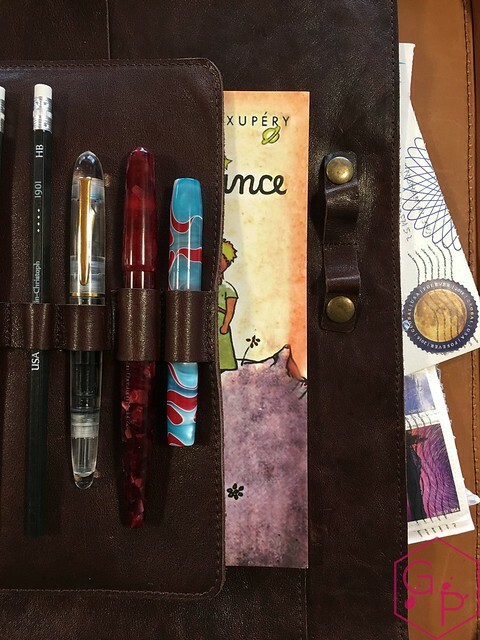 I typically spend time with notebooks, inks, and pens that are in the review queue. I carry them around, test them out in all sorts of environments (i.e. if I uncap a pen right when I am about to take a few notes in a bookstore, does it write?). Yes, I actually do weird things like this. I try to spend time with all sorts of items in the most realistic and also the weirdest ways possible, to see what it's like to live with. I actually don't like to carry my laptop around, so when I didn't have to, I had this loaded up with power for my phone, a bunch of pens, a whole bunch of notebooks that I use for various purposes, and letters. One thing I found particularly useful in motivating myself to write letters was to actually carry letters sent from friends/pen pals/during InCoWriMo, and some stationery. And stamps. And clearly I carried pens. The part I struggle with when replying to letters, or writing letters, is I never actually get myself to sit down and reply to them. By carrying them with me - and I'm not saying this is the only way to carry letters with you, it's just one of the ways that really worked for me - I was able to jot down replies on the go. I spend a lot of time in waiting rooms, so I made good use of my time instead of playing on my phone (not that that is a bad thing either). It was just an efficient use of my time, and it was productive. I enjoyed it. What if I had something larger to carry? I either would not carry it in the Port and would do so by hand or in another tote, or I would carry it in my purse. It depends on the item. This didn't happen often. The Port is a slim profile case with limited space because of that slim profile, so it's not the kind of bag you can just throw everything and a banana into. In fact, do not throw a banana in there because it will get squished and your Port will reek of banana forever. Stephen agreed to have a few photos taken - thanks for modeling! He's much taller than I am, but clearly, I am not pictured here to compare. The 13" Portfolio works well in his hand. I will say I did not find the 13" Portfolio too large to comfortably carry myself. It is a comfortable size and did not get too heavy - it limits itself in what it can carry, so it does not get overloaded. I love that this is something I felt comfortable carrying. It's not just for men. Products backed by a lifetime warranty. Leather is sourced from Tuscany, Italy, from a third generation, family-owned vegetable tannery in Ponte a Egola. The family is one of the founding members of The Genuine Italian Vegetable Tanned Leather Consortium, a group of Tuscan vegetable tanneries who follow strict quality standards and regulations. 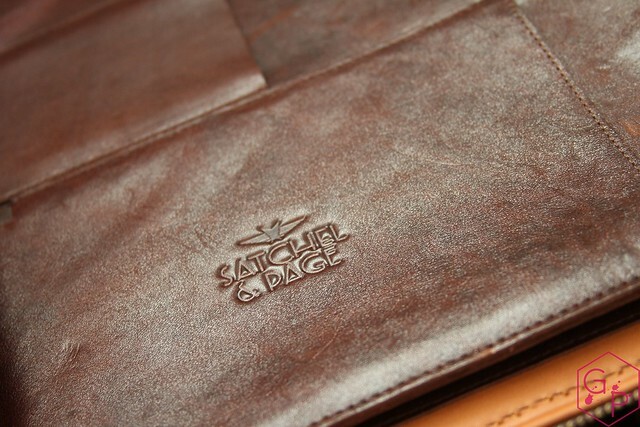 This means Satchel and Page's leather will be labeled with the official Quality Trademark certified by the Consortium. Excellent workmanship - no scrummy bits or edges. It's all very clean, well made, and robust. 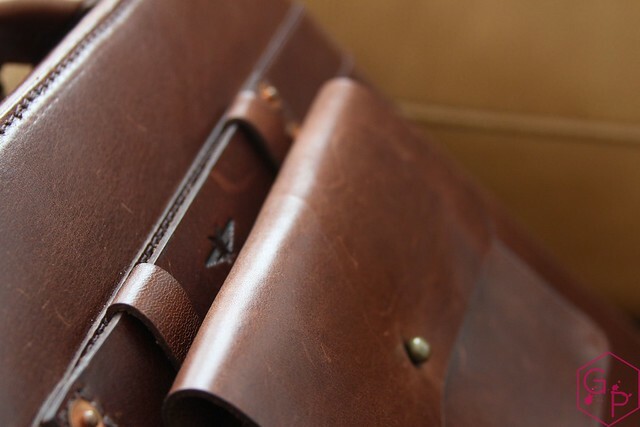 Leather pulls up and develops character so beautifully. I love it. The firm shape ensures your goods inside are protected. Zippers are high quality - they work smoothly and do not catch. Padded and adjustable shoulder strap. Great for personal use as well. Comfortable to carry in hand, or over the shoulder for longer carry. If you have a slim battery pack and a regular sized phone, you can charge your phone using your power pack and the provided snaps (to house your cables in a tidy manner) while your Port is zipped closed. 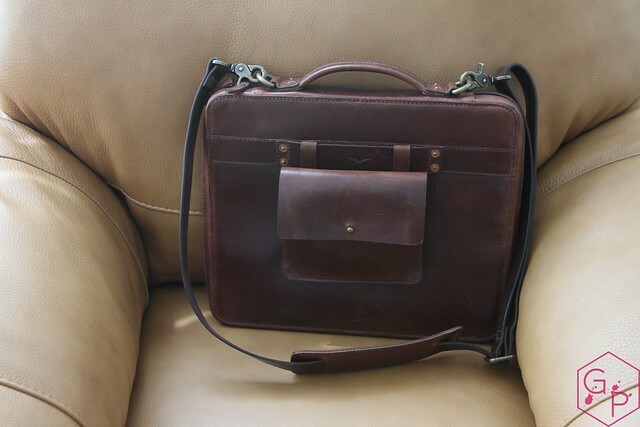 The shoulder strap clasps are strong and can take a lot of weight. A variety of loop sizes to accommodate different writing instruments. One thing I really like is that I often carry my items in pouches and cases to protect them when I shove them in a backpack. 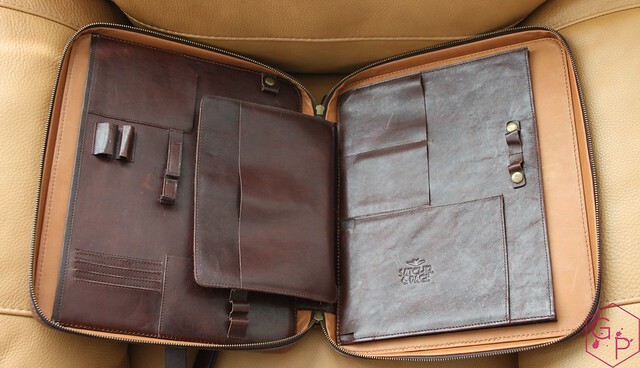 The Port Series allows me to carry my items (phone, laptop, iPad) naked, because they're protected by the leather sleeves and the security of the zipped up mobile office. This also means less weight overall, and it's more efficient. Keep your cables sorted and detangled. No one likes tangled headphones. 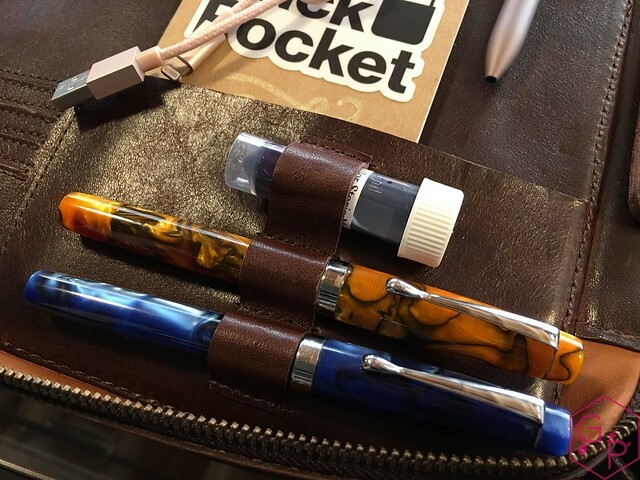 Some loops can hold ink sample vials for you fountain pen users! The loops and slots can accommodate a variety of sizes but are best suited for slimmer items. 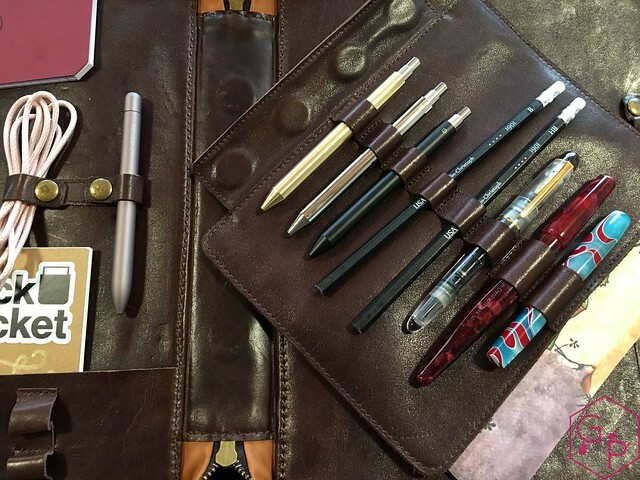 Different sized pen loops mean you'll have to check and see which of your writing instruments fit. 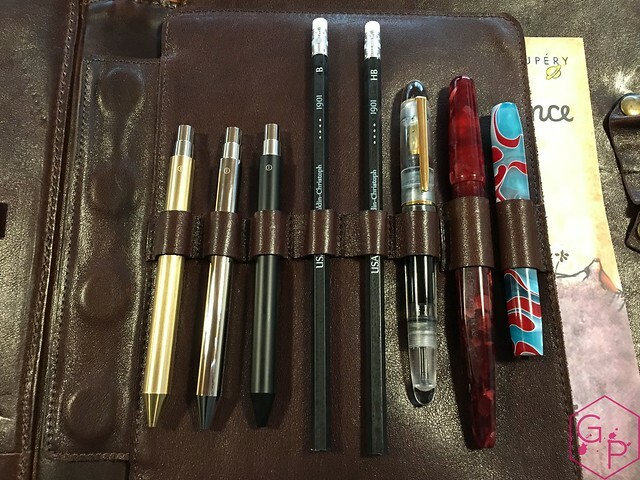 If you fill up the left flap and have a pen loop magnetic add on in the middle, as with my set up, the left side can hit your pens when the lid is closed. If you have really thick electronics - laptop, phone, power pack, etc - the slots may not hold your item. I have a giant power pack that was way too thick to fit in the designated power pack slot, but it did fit in other slots. It just required some selecting and rearranging. I also have a slimmer power pack that did fit. The removable battery pack pocket on the outside is a great idea, but could be a little larger for larger adapters. I couldn't fit a non-Apple adapter in there. The downside to the variety of loop sizes is it's hard to know what will fit - trial and error. Here's one of the downsides of stuffing the Portfolio with everything you've got: things can hit each other. 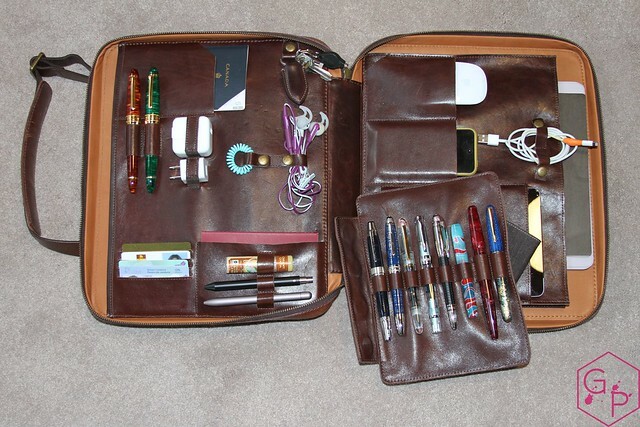 This one has a hardcover A5 notebook, my laptop, iPad, iPhone, charging pack, two charging bricks, my laptop's charger, and miscellaneous pens, pocket notebooks, pens, etc. That was way too full. First of all, I think this is a beautiful, amazing item. I love having my daily carry/essentials organized, and to have it organized with such a lovely mobile office makes it all the more fun. The Modular Leather Tech Portfolio is really well made (and the final products will be even nicer than the review unit here). The zippers are smooth and don't catch, it has firm covers so you can actually use the surface to write on/put your laptop on, and the shoulder strap is soft and padded to handle the weight of a full unit. I find having everything where I need it very comforting, and it means I don't have a bunch of things just stuffed in a pouch, stuffed in a bag. This forces me to keep things organized and clean - in a good way. 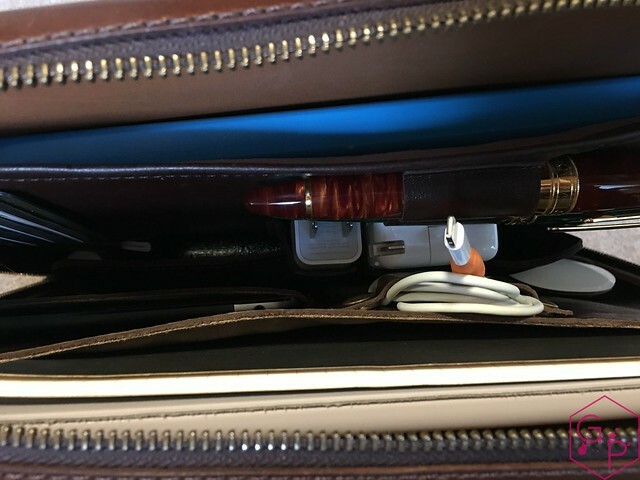 It makes me more efficient because everything I need can be carried - a few pens, my phone, a power brick, a charger, my laptop, and a notebook. 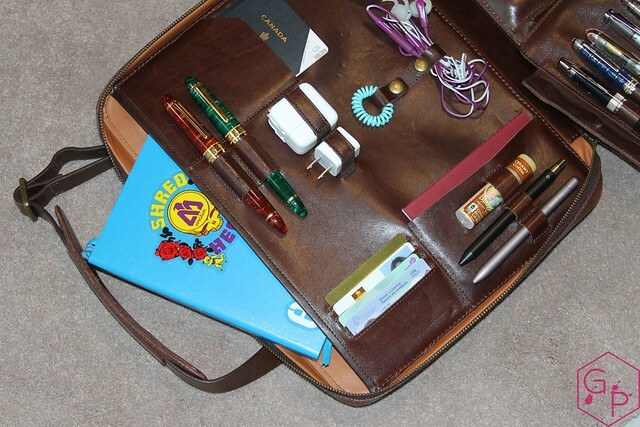 I can also carry a few miscellaneous items - cards, pocket notebook, my mouse. The Portfolio has a lot going for it, but it could also use some work. I am an Apple user, so a lot of my stuff fit without issue - the adapter, the laptop, my phone, iPad, etc. If you have a larger phone (with a case), a larger power pack or adapter, or a thicker laptop, not everything will fit so easily. The key will be picking the right items for your mobile office, and ensuring you select the correct Port for your own needs. I would love to see an expansion zipper for those days you just stuff way too much stuff in, but that would also take away from the slim profile and clean look. The fact is, I don't need this, but I really enjoy using it and carrying this when I leave the house to get some work done. It makes carrying all my things that I use for reviews and work much easier, more organized, and I get strange satisfaction out of having this all sorted. It's really a handy mobile office that allows me to also work on my lap, not just on a table. Great for commuting and working from spaces other than your own office. It's not perfect, but it's really, really nice and useful. Want to know more? Check it out on Kickstarter! For many of the things I complained about, Satchel & Page have included those items in their Kickstarter - cables that fit perfectly and slim battery packs!